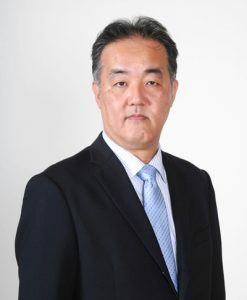 President message | NOMA ELECTRONICS CO., LTD.
We will play an integral part in making an ideal future in ten years' time. Since its founding in 1947, Noma Electrics Co., Ltd. has been selling electronic parts as its main business. We are active with our theme being “the creation of new trading company value through the improvement of 5 qualities”. The five qualities are “Improving quality for customers”, “Improving quality for suppliers”, “Improving the quality of the company itself”, “Improving quality for society”, and “Improving quality in ourselves”. We believe that all of our employees can create “new trading company value” not just “traditional company value” by pursuing these five quality improvements from each standpoint. In addition to the traditional “pursuit of trust, cost, and delivery time”, we show extreme commitment by enhancing the “new trading company value”, and we sincerely respond to various customer requests. We “Noma Electronics” are not a manufacturer. However, we have high hopes for the future of electronics and would like to help you make an ideal future over the next ten years. For example, the automobile industry is also undergoing a major change due to electronics such as EV and automatic driving. We expect it will be safer and less environmentally detrimental. On top of this, information transmission makes human movement itself unnecessary, and it may reduce time and energy spent with the development of communication technology and VR technology. In the medical field, we believe that the development of new equipment for inspection and the downsizing of equipment will make it possible for healthy and prosperous living. At first glance, the “electricity” that looks like clean energy is currently being clouded by unstable energy such as thermal power and nuclear power behind the scenes. We believe we can control the risk of the energy and make a system with less risk with overwhelming energy saving technology. The ideal future in ten year’s time is the same as a maker even if it is a trading company. 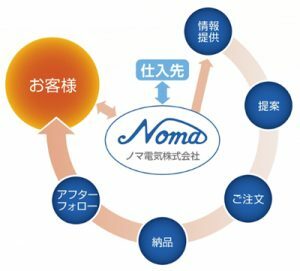 We “Noma Electronics” evolve with electronics technology, and support the electronics industry in Japan. “Overall capabilities” accumulated by an abundance of experience. We have a long history as a component trading company and have more than 100 suppliers. Therefore, we can respond to customers’ requests based on our abundance of experience gained over many years. Our “Solving Skills” have been obtained through years of experience.